Not only can you find specific text in a Word 2013 document, but you can also replace it with other text. This can be helpful, for example, if a company or person changes its name and you need to make a report or letter reflect that. You can change individual instances one-by-one, or you can use the Replace All feature to replace all instances at once. The following example utilizes a letter to demonstrate the concept of replacing text. Replace All is very convenient, but be careful that you don’t make unintended changes with it; sometimes a text string you replace is part of another word or phrase that shouldn’t be changed. In your Word 2013 document, press Ctrl+Home to move the insertion point to the top of the document. 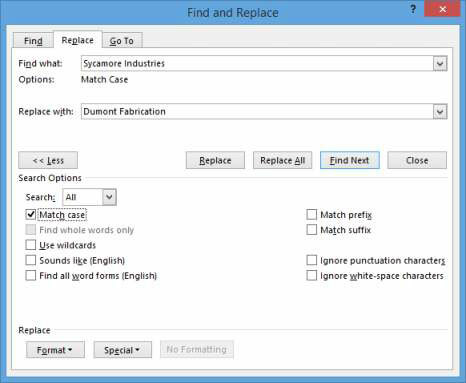 The Find and Replace dialog box opens with the Replace tab displayed. Ctrl+H is the keyboard shortcut for Replace. In the Find What box, type Sycamore Industries and in the Replace With box, type Dumont Fabrication. Click the Find Next button. The first instance of Sycamore Industries appears highlighted in the document. You can drag the title bar of the Find and Replace dialog box to move the dialog box out of the way if it obscures the found text. Click the Replace button to replace the first instance. Click the More button to reveal additional options, and then select the Match Case check box. The operation is restricted to instances that match the Find What text string’s capitalization. All remaining instances that match in capitalization are replaced. A dialog box appears stating that Word has reached the end of the document and three replacements were made. Click the Close button to close the Find and Replace dialog box, and then save the document by pressing Ctrl+S.